I have always used my walking foot to quilt straight lines because I like the look of straight lines when quilted with a walking foot. Even after I learned to free-motion quilt, whenever I have to quilt straight lines, I dutifully change out my quilting foot for the walking foot! Sometimes stitching with the walking foot and feed dog up isn’t the most convenient … like quilting piano keys, for example. As a result, I have never quilted piano keys on the border until my last quilt. After I decided to be brave and free-motion quilted the straight lines with a ruler. 1. Use the smaller sized rulers – 6″ or 8″. Anything bigger might make handling harder. 2. The key to using the ruler is to anchor it down with your hand (butting it against quilting foot), and not lose the pressure, and maintaining the same grip through an entire quilting pass. If you lose it, you might lose the exact positioning, and causes veering off and jerking in your final result. Lots of concentration needed! But once you are through one pass, take a deep breath and a mini break before you attempt the next. 3. The ruler actually has scored markings so that you don’t have to mark your quilting lines. I go ahead and mark my quilts because I find that to have to move the quilt, move the ruler AND check my quilting pass against the scored lined is too much for little old me quilting on a home machine. 4. When doing piano keys, I find that it’s easier to quilt horizontally than it is vertically. For me, at least. You just have to play a bit and find out which one suits you the best. 5. I find that the Fine Line Ruler isn’t as good for quilting in the ditches because sometimes a seam is not perfectly straight, especially after the surrounding area is already quilted. 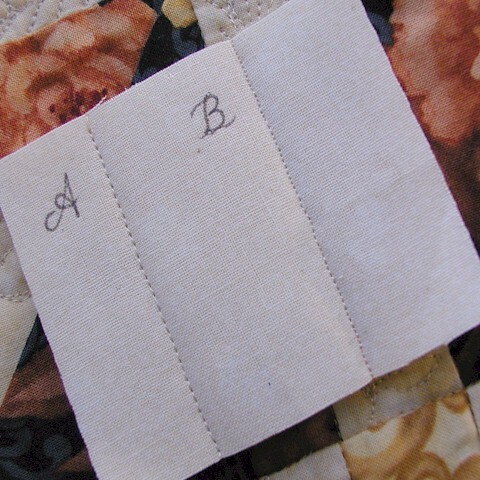 If I absolutely have to quilt in the ditch during free-motion quilting to move from one spot to the next, I actually quilt in the style of “B” line, as shown above. I just gingerly take very small step to quilt along the seams. The stitches should “bury” themselves in the “ditches” (thus quilting in the ditches) and not visible. Now I can quilt piano keys and not have to be frustrated with my stitch quality. You will see more piano keys in my future quilts, I am sure. In this case, a little bravery really went a long way… sometimes we just need to be a little brave, don’t we? p.s. I have also quilted curved cross-hatching using ruler. Click here to read about it. This entry was posted in Quilting, Thread Talk and tagged Domestic Machine Quilting, Fine Line Quilting Rulers, Free-motion quilting, Quiting Piano Keys. Bookmark the permalink. I love your Thread Talks, Wendy, and this one is no different! 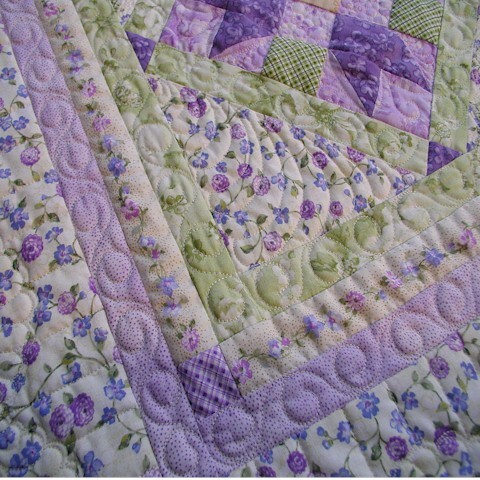 BUT…..I want to know more about the first quilt shown above….the one with the flowers and the cats on it!!! Any place we can see more of it, all of it, and more info about it? I love it! I am with Helen (above) that my Janome has the stitch in the ditch foot which works very well. This post however, is very interesting! I am going to check out these rulers. I do love the piano key quilting. I just love your blog and how informative you are. Thank you so much for sharing your talent and ideas with us. P.S. Do you roll up your quilts when quilting with your machine? Or do you use the fluff-style for quilting? Just curious. Not sue I could handle that thing and the bulk of a quilt and get everything as nice as you. You are amazing. I can imagine what you could do with a long arm. I love the rulers! What are they called – where did you get them? It’s beautiful. I would need one even with the walking foot. You really have me curious about these rulers, I would love to see a video of them being used on a domestic machine as it looks much easier on a long arm. Hi Wendy, thats great, I too have seen these used on long arms but never thought it could be applied to dsm fmq.. you should do us a little movie of you using it ;) love the kittens by the way, running all over the place ! Hi Wendy…thanks for the great tute again! I’ve always done my piano keys with strips of painter’s tape. so now a new way. Loved the Kitty Kollage, too. Thanks for the great post, Wendy! 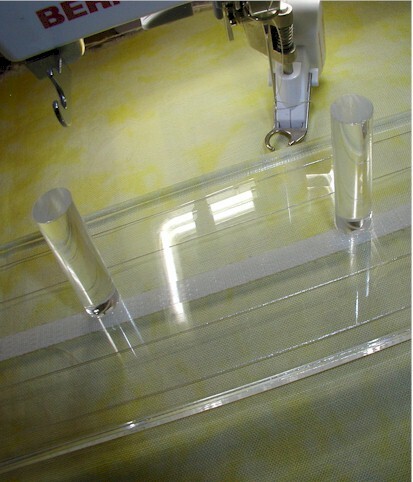 I’ve been considering purchasing the walking foot for my Bernina Aurora. I think your post has pushed me to do just that. :) Happy Wednesday! I love your thread talks. This ruler (as well as the curved one) is on my wish list. I’m like you in the fact my FMQing straight lines look like your B but worse. Although I’m still trying to get better. As soon as my applique blocks are finished, I’m hoping to get some machine time booked. Thanks for sharing your knowledge! The rulers really do give you some guidance, don’t they? The A line looks perfect. those rulers are neat but I think I will just stick with my walking foot. I don’t do big quilts like you and when I do it is all straight line stitching. I just can’t seem to get my tension right no matter what I do. I’m going to try FRree-motion straight stitching again, this time using a ruler. I DO like the look of your stitches. I FMQuilt on a DSM, and the straight lines are a pain the the patootie! Yet, are needed on occasion. 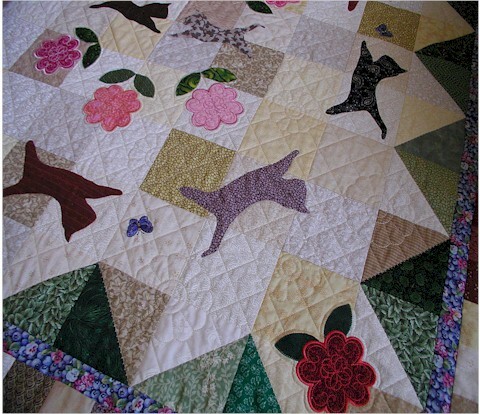 Your quilting is lovely as always. Thanks so much for sharing your secrets! I’m learning a lot and maybe someday will find the courage to try free motion!! Thank you so much for sharing your expertise. I have the ruler you had shown but didn’t realize one could use it when using our domestic machines. As usual I haven’t tried it yet but will go and make some fabric sandwiches and practice. Thanks for the explanation. I don’t know if I could ever do straight lines, but I can see this would help. I have been studying the rulers used by long arm quilters and wondered if they could be used on a domestic machine – glad to know you have tried them and like them. Did you investigate more than one brand before you settled on these? Wendy, do you drop your feed dogs when using your walking foot?? I have not dropped my feed dogs on my Bernina, even when I do free motion quilting. My machine seems to do well even with the feed dogs up. Just wondering how you do this with your machine.